Anyway, I think you get the idea. Your basement is not storage for junk! You need to flush that thought from your mind as surely as you would the toilet. If you want the efforts you put into basement organization to last longer than a week, then this is the first and arguably most important step. We’re all creatures of habit and getting rid of this particular habit will probably be a struggle for most. So the next time you find yourself heading down the stairs with something you’re going to “store” in the basement, ask yourself this: Do you really need to keep it or is it better to get rid of it? Be honest with yourself and if you do decide to junk it, follow through with your decision! We all tend to form an irrational attachment to items, especially those that we’ve had for a long time. Granted, some of these things have real sentimental value but the majority of them don’t. Let’s face it; you haven’t missed most of the stuff that’s been hiding in your basement for the last 10 years, and you probably won’t miss them once you’ve thrown them in the dumpster either. 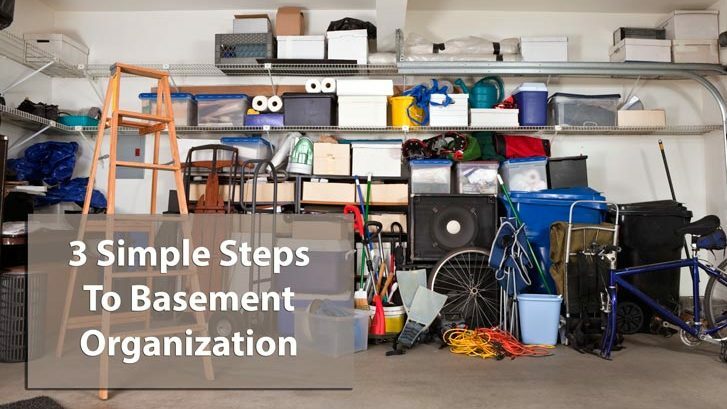 Now that you’re mentally prepared to part with your junk, the next step in basement organization will be to divide everything into four categories: keep, sell, donate or trash. If you find that your “trash” pile is tiny compared to your “keep” pile, go through you keep pile again! Remember the unspeakable critters rooting for your “keep” pile and get rid of your garbage. With some basements, it can be hard to get started because of the overwhelming amount of garbage to sift through. It’s best to just pick a section of the basement and start working on it. Be methodical and item by item, decide on which category it’s going into. Don’t skip over items and remember to be practical! After you’re done, you’ll have four piles. The trash pile goes to, well, the trash. Goodbye. Sayonara. If you have a lot of garbage or large items in this pile you may need a garbage bin rental to throw it all into. Next, look up local charities or locations of donation boxes so that you can donate the items from your “donate” pile. You’d be surprised by the number of charities that will happily take the junk that’s been collecting dust in your basement. Some of the things you’ve stored in the basement will still possibly be valuable and these are the ones you probably put into your “sell” pile. You can sell these on kijiji or ebay, or have a garage / yard sale to clear these items out. If you decide to sell something rather than donate or trash it, make sure that you sell it as fast as possible because it may just end up back in your basement and sabotage all of your basement organization efforts. If no one will buy it then it’s time to bite the bullet and donate it. And that just leaves the keep pile (yay!). By now you’ve trimmed all your junk down to just a few necessities right? For this step, you’ll need to put on your sorting hat again and separate your stuff into new categories such as sporting equipment, childhood memories (wait, you still kept those? ), seasonal items and so on. After you’ve finished sorting the items you’re keeping, it’s time to think about basement storage ideas. It’s best to invest in proper storage for the things you’ve decided to keep. Plastic, see-through boxes are great for easy access to items used often (because there shouldn’t be any items left that aren’t often used). Divide your basement into sections and put your belongings from each category in their own section of the basement. They’ll be easier to find that way. If your basement isn’t finished, basement shelving is essential. Not only does the shelving protect your belongings from flooding and keep them off the typically damp basement floors, but they also increase basement storage space and valuable floor space. Even if all your belongings are in boxes, it’s more convenient to put them on shelves rather than stacking them on top of each other. I don’t know about you, but the item I need is always in the box at the bottom of the stack! You’ll find many different options for basement shelving: floating shelves, metal shelves and resin. You’ll probably get the most value out of resin shelving units, but for your heavier belongings you may need the strength of metal shelving. If you’re handy you can even build your own wooden shelving which is also quite sturdy. More importantly, think twice before you buy something you don’t need so storage is never an issue and you’ll never have to throw it out. Think green, like we do!